Another one of my blogs from a few years ago. This was a series I did based on dead people talking from the grave. Josh is a teenager who took his own life. I think we all know some kids who have tried or succeeded. Maybe my story will shed some light on their motivations or at least help us consider them more. 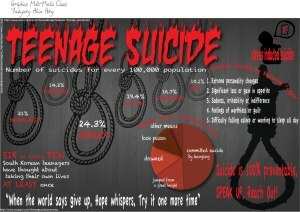 There are many teenage suicides in this country every year. Each semester the Graphics Multi-Media Students select a global issue that is meaningful to them and then create a logo and infographic about their issue. For the next several weeks, my blogs are going to consist of “autobiographies” written by some very special people. They have one thing in common. They are all dead. Some have a burial place and some were simply discarded like pieces of trash. Their stories will be told by the deceased themselves. They cry out from the fields, rivers and graveyards to speak. I have heard their cries. They want me to tell their stories to you. They want you to know what their living and dying was for. This week, Josh will tell you the story of his life and death. Previous Autobiographies from the Dead – Cindy the Wife Next A Friend Is?